Difference between revisions of "How did the Emperor Trajan change the Roman Empire?" The Emperor Trajan (53-117 AD) has traditionally been regarded as one of the greatest Roman Emperors’, but modern historians have argued that his legacy was not wholly positive. This article will discuss the importance of this Emperor and his impact on the Empire. It will argue that his conquests while not always beneficial to the Empire did help to strengthen it for many decades. His conquest in Dacia, Arabia and Mesopotamia were of real benefit to the Empire, however, his conquests in Parthia were transitory and wasteful. Trajan was a dynamic administrator and he did much to reverse some of the abuses that had developed under previous Emperors such as Domitian. Moreover, his domestic policies helped to improve the socio-economic condition in Italy. Emperor Trajan (53-117 AD) has traditionally been regarded as one of the greatest Roman Emperors’, but modern historians have argued that his legacy was not wholly positive. This article will discuss the importance of this Emperor and his impact on the Empire. It will argue that his conquests while not always beneficial to the Empire did help to strengthen it for many decades. His conquest in Dacia, Arabia, and Mesopotamia was of real benefit to the Empire. However, his conquests in Parthia were transitory and wasteful. Trajan was a dynamic administrator, and he did much to reverse some of the abuses that had developed under previous Emperors such as Domitian. Moreover, his domestic policies helped to improve the socio-economic condition in Italy. In 98 AD Trajan became Emperor after the death of Nerva. Trajan proved to be an energetic ruler and immediately reduced the influence of the Praetorian Guard.<ref> Mommsen, Theodor A History of Rome Under the Emperors (London: Routledge, 1999), p 113</ref> He secured support by offering donations to the legions and the population of Rome and reduced taxes. Trajan was very much a builder and he helped to finance many public buildings and ordered the building of many aqueducts and prohibited wasteful expenditure on festivals. He also initiated a series of social welfare reforms. Trajan also overhauled the administration of the Empire and ended abuses by Senators. His domestic policy achievements are impressive, but his main focus was on military glory. He abandoned the policy of Augustus, of not seeking to expand the Empire.<ref>Suetonius, Life of Augustus, xxv</ref> Only Britain had been added to the Empire since the death of the first Emperor. Trajan was determined to expand Rome’s borders and for the first time in a century he pursued an active policy of conquest. In 98 AD Trajan became Emperor after the death of Nerva. Trajan proved to be an energetic ruler and immediately reduced the influence of the Praetorian Guard.<ref> Mommsen, Theodor A History of Rome Under the Emperors (London: Routledge, 1999), p 113</ref> He secured support by offering donations to the legions and the population of Rome and reduced taxes. Trajan was very much a buildera series of civil wars had weakened that Empireand he helped to finance many public buildings and ordered the building of many aqueducts and prohibited wasteful expenditure on festivals. He also initiated a series of social welfare reforms. Trajan also overhauled the administration of the Empire and ended abuses by Senators. His domestic policy achievements are impressive, but his main focus was on military glory. He abandoned the policy of Augustus, of not seeking to expand the Empire.<ref>Suetonius, Life of Augustus, xxv</ref> Only Britain was to the Empire since the death of the first Emperor. Trajan was determined to expand Rome’s borders, and for the first time in a century, he pursued an active policy of conquest. He annexed the entire area of modern Iraq and incorporated it into the Empire. An anecdote is told that when Trajan saw the Persian Gulf he wept because he was too old to conquer the rest of the known world. In 116, while in Antioch, the Emperor nearly died in an earthquake and a series of revolts broke out across the Roman territories in the east.<ref>Cassius Dio, 10, 19</ref> A serious Jewish revolt broke out in several areas of the eastern Mediterranean. Trajan was ill and old and decided to journey back to Rome, but he died in 116 AD, in Asia Minor. The Emperor had no children and adopted Hadrian an experienced soldier and governor. After Trajan’s death Hadrian became ruler of the Roman World. He annexed the entire area of modern Iraq and incorporated it into the Empire. An anecdote is told that when Trajan saw the Persian Gulf, he wept because he was too old to conquer the rest of the known world. In 116, while in Antioch, the Emperor nearly died in an earthquake and a series of revolts broke out across the Roman territories in the east.<ref>Cassius Dio, 10, 19</ref> A severe Jewish revolt broke out in several areas of the eastern Mediterranean. Trajan was ill and old and decided to journey back to Rome, but he died in 116 AD, in Asia Minor. The Emperor had no children and adopted Hadrian an experienced soldier and governor. After Trajan’s death, Hadrian became ruler of the Roman World. The conquest of Dacia, which was a powerful military force in the Balkans and a real rival of Rome in the Balkans was a significant achievement. The Dacians had been a problem for the Romans since the time of Julius Caesar. However, no Roman Emperor had been effectively able to contain them. The conquest of Trajan from a military point of view was remarkable as the kingdom consisted of fortified settlements in a mountainous region<ref>Cassius Dio, 10, 23</ref>. It has often been argued that Domitian helped to weaken the Dacians before the conquest in 106 AD. The addition of the old Dacian kingdom to the Empire initially strengthened Rome. The gold mines of the area boosted the economy as did the new lands that were acquired. The annexation of the kingdom strengthened the Danube frontier and secured the Balkans for decades. However, many argue that the conquest of Dacia was ultimately a drain on the Empire. Moreover, over time as the Roman legions weakened it proved difficult to defend. In the crisis of the 3rd century, the province was abandoned to the Goths and other tribes<ref>Bennet, p 189</ref>. However, the territory had remained part of the Empire for 150 years and at least in the first century of Roman rule it brought the empire new revenues and was a bulwark against barbarian incursions. The conquest of Dacia, a powerful military force in the Balkans and a real rival of Rome, was a significant achievement. The Dacians had been a problem for the Romans since the time of Julius Caesar. However, no Roman Emperor had been effectively able to contain them. The conquest of Trajan from a military point of view was remarkable as the kingdom consisted of fortified settlements in a mountainous region.<ref>Cassius Dio, 10, 23</ref> It has often been argued that Domitian helped to weaken the Dacians before the conquest in 106 AD. The addition of the old Dacian kingdom to the Empire initially strengthened Rome. The gold mines of the area boosted the economy as did the new lands that were acquired. The annexation of the kingdom strengthened the Danube frontier and secured the Balkans for decades. However, many argue that the conquest of Dacia was ultimately a drain on the Empire. Moreover, over time as the Roman legions weakened it proved difficult to defend. In the crisis of the 3rd century, the province was abandoned to the Goths and other tribes.<ref>Bennet, p 189</ref> However, the territory had remained part of the Empire for 150 years and at least in the first century of Roman rule it brought the empire new revenues and was a bulwark against barbarian incursions. There had been no serious efforts to conquer large areas of the Parthian Empire since the time of Mark Anthony. Trajan wanted to conquer all or at least part of the Empire. However, it was a vast, sprawling and diverse polity and the Romans could never have absorbed it even with their vast resources and capabilities. Trajan had been accused of megalomania because of his ambitions in the east. Despite his capture of Ctesiphon and the annexation of the western sections of the Parthian Empire the Romans never really controlled the majority of the new territories. The campaign in the East overstrained the resources of the Romans. It left the legions in Mesopotamia isolated and they were on the point of being cut-off when Trajan died. Furthermore, the efforts in Parthia left many areas poorly guarded and this was a factor in the Jewish Revolts that destabilized the eastern provinces. This threatened Roman control in the area. It cannot be denied that Trajan’s campaign weakened the Empire in the east. This forced Hadrian to evacuate the newly conquered lands to retrieve the situation and he is credited with effectively staving off a collapse in the east. However, Trajan achievements in the east were not transitory. In the longer term some of the conquests of the Emperor strengthened the Roman East. The conqueror of Dacia added two provinces in the east the Nabatean Kingdom (modern Jordan) and northern Mesopotamia (Northern Iraq). These provinces greatly added to the revenues of the Empire and also strengthened the Roman strategic position in the region. The province of Mesopotamia meant that Rome could keep Parthia on the defensive. Roman supremacy was not challenged for over a century in the Ancient Near East. There had been no serious efforts to conquer large areas of the Parthian Empire since the time of Mark Anthony. Trajan wanted to conquer all or at least part of the Empire. However, it was a vast, sprawling and diverse polity and the Romans could never have absorbed it even with their vast resources and capabilities. Trajan had been accused of megalomania because of his ambitions in the east. Despite his capture of Ctesiphon and the annexation of the western sections of the Parthian Empire, the Romans never really controlled the majority of the new territories. The campaign in the East overstrained the resources of the Romans. It left the legions in Mesopotamia isolated, and they were on the point of being cut-off when Trajan died. Furthermore, the efforts in Parthia left many areas poorly guarded which led to Jewish revolts that destabilized the eastern provinces. Roman did not have any meaningful control over this region. Trajan’s campaign fundamentally weakened the Empire in the east. Hadrian was forced to conquer these lands to stave off a complete collapse in the east. In the longer term, some of the conquests of the Emperor strengthened the Roman East. The conqueror of Dacia added two provinces in the east the Nabatean Kingdom (modern Jordan) and northern Mesopotamia (Northern Iraq). These provinces greatly added to the revenues of the Empire and also strengthened the Roman strategic position in the region. The province of Mesopotamia meant that Rome could keep Parthia on the defensive. Roman supremacy was not challenged for over a century in the Ancient Near East. The Roman Empire was at its zenith during the reign of Trajan. However, he like the members of the Senate was worried about the relative decline of Italy. It had not prospered as much as the other Imperial territories. The population of Italy was falling, and many were worried about the reduced number of Italians who were serving in the legions<ref>Alston, Richard Aspects of Roman History 31BC-AD117 (Abingdon, Routledge, 2014),p. 115</ref>. Trajan used much of the booty from his conquests on public works in the Italian cities such as Rome. This was to boost the urban economies and to encourage the landed aristocracy to spend more time in cities. Trajan also ordered Senators from the provinces, to own land in Italy. This was to ensure that the Senatorial elite, irrespective of their origin had links with Rome and Italy. Trajan also introduced the alimieta, this was a charitable scheme and it was a variety of subsidies to local communities<ref>Alston, p 118</ref>. It involved the regular distribution of money to the public but only to Italian communities. It also seems that it helped to improve the lot of poor Italians and infanticide was much reduced because of the payment of the alimieta There are those who believe that Trajan developed this policy to strengthen Italy, and therefore the core of the Empire. This was to ensure that Italians remained preeminent in the Roman Empire. The Emperor’s policy was at least partially successful, because it arrested the decline in Italy and it was adopted by later Emperors<ref>Bennet, p 119</ref>. Trajan has been criticized for his many wars and especially for his devaluation of the coinage. This it is believed set a dangerous precedent for later Emperors however, Trajan left his successor Hadrian with a healthy treasury and the economy was well-managed during his reign. The conqueror of the Dacians was an able administrator and unlike his predecessors respected the constitution and the laws of Rome. Trajan enacted some laws that improved the status of slaves and it became illegal for masters to abandon old slaves. He forbade the use of informers and there were no treason trials during his years in power. Trajan did not rule as an autocrat like so many of his predecessors <ref>Pliny the Younger, Letter 10. 68</ref>. It has been stated that he gave the Empire its longest period of stability and good government in its history<ref>Bennet, p. 10</ref>. 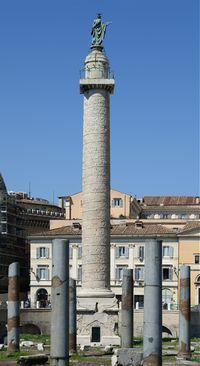 Trajan used much of the booty from his conquests on public works in the Italian cities such as Rome. This was to boost the urban economies and to encourage the landed aristocracy to spend more time in cities. Trajan also ordered Senators from the provinces, to own land in Italy. This ensured that the Senatorial elite, irrespective of their origin had links with Rome and Italy. Trajan also introduced the alimieta, this was a charitable scheme, and it was a variety of subsidies to local communities.<ref>Alston, p. 118</ref> It involved the regular distribution of money to only the Italian communities. It helped improve the lives of poor Italians, and the alimieta even reduced the number of instances of infanticide. Trajan developed this policy to strengthen Italy and the core of the Empire. This ensured that Italians remained preeminent in the Roman Empire. The Emperor’s policy was at least partially successful because it arrested the decline in Italy and it was adopted by later Emperors.<ref>Bennet, p 119</ref> Trajan has been criticized for his many wars and especially for his devaluation of the coinage. This it is believed set a dangerous precedent for later Emperors however, Trajan left his successor Hadrian with a healthy treasury and the economy was well-managed during his reign. The Emperor Trajan has been acclaimed as a great Emperor but also as an egomaniac who loved war and who seriously undermined the Empire. The truth is that Trajan had many achievements but also some glaring failures. His conquest expanded the Empire and generated new revenues for Rome and improved its strategic position with regard to its enemies. However, his adventures in Parthia were costly and could have ended in disaster and most of them had to be relinquished by the Emperor Hadrian. Trajan’s domestic policy had some successes such as his efforts to strengthen Italy and his reform of the penal code with regard to slaves. His administration of the Empire was excellent, and the economy thrived under him. Trajan can be regarded as a great Emperor and justifies the acclaim that he received from his fellow Romans in the centuries after his death. The Emperor Trajan has been acclaimed as a great Emperor but also as an egomaniac who loved war and who seriously undermined the Empire. The truth is that Trajan had many achievements but also some glaring failures. His conquest expanded the Empire and generated new revenues for Rome and improved its strategic position with regard to its enemies. However, his adventures in Parthia were costly and could have ended in disaster. Most of his gains had to be relinquished by Hadrian. Trajan’s domestic policy had some successes such as his efforts to strengthen Italy and his reform of the penal code concerning slaves. His administration of the Empire was excellent, and the economy thrived under him. Trajan can be regarded as a great Emperor and justifies the acclaim that he received from his fellow Romans in the centuries after his death. Trajan’s reign (98-117 AD) occurred at perhaps one of the greatest eras in Roman History. In the First Century A.D., the economy of Rome had been expanding for many years, and the Empire continued to expand. The period witnessed a cultural renaissance, and many of the great Latin writers wrote their greatest works at this time. Successive Emperors maintained the system that was perfected by Augustus, which was an imperial system that shared power with the Senatorial elite. This system had provided stability to a large part of Europe and the Near East. Marcus Ulpius Traianus was born in what is now modern Spain and was of Italian descent. His father was a general and governor and was later enrolled in the Senate. Trajan grew up in Rome, and he served with his father in Syria, and he later enjoyed the favor of Emperor Domitian, and in 91 AD he served as consul. In 96 AD, Domitian was assassinated in a conspiracy and Nerva ascended the throne. 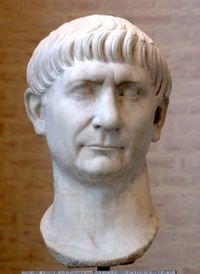 Trajan was governor of Lower Germany and was in command of several legions and was a very important power broker in the years after the death of Domitian. Nerva who was advanced in years adopted him as his son and heir. In 98 AD Trajan became Emperor after the death of Nerva. Trajan proved to be an energetic ruler and immediately reduced the influence of the Praetorian Guard. He secured support by offering donations to the legions and the population of Rome and reduced taxes. Trajan was very much a buildera series of civil wars had weakened that Empireand he helped to finance many public buildings and ordered the building of many aqueducts and prohibited wasteful expenditure on festivals. He also initiated a series of social welfare reforms. Trajan also overhauled the administration of the Empire and ended abuses by Senators. His domestic policy achievements are impressive, but his main focus was on military glory. He abandoned the policy of Augustus, of not seeking to expand the Empire. Only Britain was to the Empire since the death of the first Emperor. Trajan was determined to expand Rome’s borders, and for the first time in a century, he pursued an active policy of conquest. In modern Romania, a powerful confederation of Thracian tribes, the Dacians had proven a formidable foe and had defeated Roman governors in the past. Trajan after careful preparations invaded Dacia and in 101-102 reduced the Dacian kingdom to the status of a vassal. However, in 105 the Dacians revolted, and Trajan invaded the area and in a series of bloody campaigns ended the revolt with the capture of the capital Sarmizegethusa (106 AD). Dacian resistance was ended with the suicide of their king and chief priest, Decalbus. Trajan organized the kingdom into a Roman Province, and he encouraged settlers from all over the Empire to settle in the new territory. Trajan was a restless figure, and he seems to have sought to emulate the achievements of Alexander the Great and Julius Caesar. He recruited a large army for the invasion of Parthia, the Romans greatest enemy. First, he annexed the Nabatean Kingdom with its famous capital of Petra to secure his flank. The Parthian campaign began in 105/106 AD, and it took place at a time when that Empire had been weakened by a series of civil wars. Despite its problems, the Parthians defended their territories fiercely. They even placed a puppet on the throne of Armenia in 110 AD. Trajan launched a ferocious counter-attack and recaptured Armenia and later conquered Northern Mesopotamia (modern North Iraq) and organized it into a province. He built a road to link the province to the rest of the Empire, and this allowed his legions to strike deep into the heart of the Parthian Empire. In 115 he marched his army down the Tigris River, and he swiftly captured the Parthian summer capital of Ctesiphon and advanced down the Tigris to the Persian Gulf. He annexed the entire area of modern Iraq and incorporated it into the Empire. An anecdote is told that when Trajan saw the Persian Gulf, he wept because he was too old to conquer the rest of the known world. In 116, while in Antioch, the Emperor nearly died in an earthquake and a series of revolts broke out across the Roman territories in the east. A severe Jewish revolt broke out in several areas of the eastern Mediterranean. Trajan was ill and old and decided to journey back to Rome, but he died in 116 AD, in Asia Minor. The Emperor had no children and adopted Hadrian an experienced soldier and governor. After Trajan’s death, Hadrian became ruler of the Roman World. The conquest of Dacia, a powerful military force in the Balkans and a real rival of Rome, was a significant achievement. The Dacians had been a problem for the Romans since the time of Julius Caesar. However, no Roman Emperor had been effectively able to contain them. The conquest of Trajan from a military point of view was remarkable as the kingdom consisted of fortified settlements in a mountainous region. It has often been argued that Domitian helped to weaken the Dacians before the conquest in 106 AD. The addition of the old Dacian kingdom to the Empire initially strengthened Rome. The gold mines of the area boosted the economy as did the new lands that were acquired. The annexation of the kingdom strengthened the Danube frontier and secured the Balkans for decades. However, many argue that the conquest of Dacia was ultimately a drain on the Empire. Moreover, over time as the Roman legions weakened it proved difficult to defend. In the crisis of the 3rd century, the province was abandoned to the Goths and other tribes. However, the territory had remained part of the Empire for 150 years and at least in the first century of Roman rule it brought the empire new revenues and was a bulwark against barbarian incursions. The Roman Empire was at its zenith during the reign of Trajan. However, he like the members of the Senate was worried about the relative decline of Italy. It had not prospered as much as the other Imperial territories. The population of Italy was falling, and many were worried about the reduced number of Italians who were serving in the legions. Trajan used much of the booty from his conquests on public works in the Italian cities such as Rome. This was to boost the urban economies and to encourage the landed aristocracy to spend more time in cities. Trajan also ordered Senators from the provinces, to own land in Italy. This ensured that the Senatorial elite, irrespective of their origin had links with Rome and Italy. Trajan also introduced the alimieta, this was a charitable scheme, and it was a variety of subsidies to local communities. It involved the regular distribution of money to only the Italian communities. It helped improve the lives of poor Italians, and the alimieta even reduced the number of instances of infanticide. Trajan developed this policy to strengthen Italy and the core of the Empire. This ensured that Italians remained preeminent in the Roman Empire. The Emperor’s policy was at least partially successful because it arrested the decline in Italy and it was adopted by later Emperors. Trajan has been criticized for his many wars and especially for his devaluation of the coinage. This it is believed set a dangerous precedent for later Emperors however, Trajan left his successor Hadrian with a healthy treasury and the economy was well-managed during his reign. Trajan was an able administrator and unlike his predecessors respected the constitution and the laws of Rome. Trajan enacted some laws that improved the status of slaves and it became illegal for masters to abandon old slaves. He forbade the use of informers, and there were no treason trials during his years in power. Trajan did not rule as an autocrat like so many of his predecessors. It has been stated that he gave the Empire its longest period of stability and good government in its history. Stadter, Philip A., and Luc Van der Stockt, eds. Sage and emperor: Plutarch, Greek intellectuals, and Roman power in the time of Trajan (98-117 AD). Vol. 29. Leuven University Press, 2002.